The Which Greek Island Kefalonia resort guide is designed to help travellers and holiday makers decide which towns and villages to visit on the fabulous Ionian island of Kefalonia. If you’re anything like me then you don’t want to just book your holiday in the first town or village that your travel agent suggests, you want to make sure that the village has everything that you want, whether that is exciting night life or beautiful scenery this page helps you narrow it down and find where to stay in Kefalonia. The map above should help you to see where each village is on the island as well, in case you are planning on getting a car and travelling around this helps you to make sure that the village you book is close to other places that you want to visit. The main tourist resorts are based, as you might expect, around the best beaches. Lassi is a popular destination and has a number of great sandy beaches nearby, Skala is always popular and has a huge beach. Other popular places are Lixouri, Fiskardo and the capital Argostoli. If you want to get away from the popular resorts and see something a bit more Greek, why not try the beautiful Assos or the pretty little port village of Agia Efimia both are away from the tourist crowds and a lovely place to spend the afternoon. Another great choice is the harbour town of Sami, it’s especially good if you like boat trips as many of them leave from Sami. 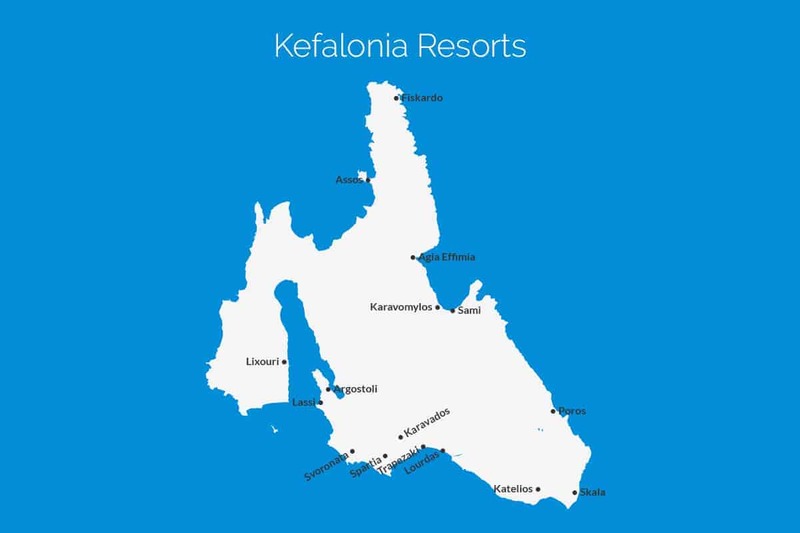 We’ve listed below the main resorts on Kefalonia, all you have to do is click the ones that you are interested in and that’ll take you to a more in depth look at that particular resort. Agia Effimia is a small picturesque fishing village just north of Sami in Kefalonia. It’s a regular stop for yachts and has lots of tavernas, bars and restaurants, mainly around the harbour front with lovely views of the bay. There’s a very narrow pebble beach as well as other beaches that aren’t too far away. Argostoli is the capital and main port town of Kefalonia, there is regularly a couple of cruise liners in the bay meaning Argostoli is often very busy. There is a main pedestrianised street with bars and shops that runs parallel to the harbour, at the end of this street is the central square that is surrounded by open air seating restaurants and bars. Assos is a small village set in a sleepy bay, it’s not one of the main tourist resorts of Kefalonia making it perfect for those wanting a traditional Greek, quiet and relaxing break. Assos is about an hours drive from both the capital Argostoli and the airport. Assos has a small shingle beach and a little fishing harbour too. Fiskardo is a gorgeous, picturesque Greek harbour village on the Northern tip of Kefalonia. You’ll need to make a special effort to go to Fiskardo as it’s not somewhere you would pass on your way somewhere else. It has a traditional Greek feel and has plenty of restaurants to enjoy a harbour side lunch or dinner. Karavados is a delightful village that stands at the foot of mount Ainos, surrounded by pine trees, olive groves and citrus groves. It’s close to the southern coast of Kefalonia between Argostoli and Skala. Karavados isn’t on the beach but there is Agios Thomas beach just down the road and Trapezaki beach a couple of minutes along the coast. Karavomylos is close to Sami on the road that leads to Agia Efimia out on the east coast of Kefalonia. It’s a very quiet area of the island with just a few restaurants and tavernas and certainly no clubs, the nearby beaches are mainly pebble but if you explore you can often find a secluded cove to have all to yourself. Katelios is a quiet fishing village on the south coast of Kefalonia down in the south east corner of the island, roughly 30km from the capital. There’s two sections to Katelios, Ano Katelios which is slightly inland and not particularly touristy. and Kato Katelios which is on the beach and where you’ll find most of the tourists and facilities. Lassi is one of the most popular resorts in Kefalonia, it’s a short drive from the airport and centres around the main road or “strip” that is about a mile long, the biggest criticism of Lassi is that it’s not a particularly authentic Greek resort but on the other hand it has everything a tourist needs right on the door step. Lixouri is the second largest town on Kefalonia and the central town of the Palliki peninsula. Lixouri has a lot to offer making it a good alternative for those seeking a slower paced break. Life in Lixouri revolves around the main square that’s surrounded by tavernas and restaurants serving up delicious freshly caught sea food and local delicacies. Lourdas, sometimes also known as Lourdata is set against a steep hillside and in one of the largest bays on Kefalonia so you’ll definitely need your walking shoes on if you want to explore the area. There’s no real village centre in Lourdas, just a collection of hotels, restaurants and shops dotted about around the road side and down by the beach. The port-town of Poros is located on the east coast of Kefalonia and is the primary link from Kefalonia to mainland Greece with a daily service to Kilini. Poros is not one of the more popular tourist resorts but as it’s a working Greek town it has a more authentic, traditional feel to it which can be exactly what some people are looking for. Sami is a relatively quiet port town set at the foot of the hills on the northern coast of Kefalonia. Sami is one of the major ports on the east coast of Kefalonia and because of this it offers a wealth of boat trips including day trips to Aetos on the neighbouring island of Ithaka as well as ferrys to Patra on the mainland. Skala is a resort on the south east coast of Kefalonia. Skala has been criticised for lacking a traditional Greek feel, it does however have a great beach, ample tavernas, restaurants, bars and even a club. Due to it’s location Skala is not great for those that want to explore the island as most of the attractions are a long way away. Spartia is a small village a few miles south east of the airport in Kefalonia, It’s not one of the more popular resorts and therefore hasn’t suffered from over population of tourists or been spoiled by an over abundance of tourist amenities meaning it has more of a Greek feel to it than the likes of Lassi or Skala. Svoronata is a village in Kefalonia, it’s about a mile inland and surrounded by gorgeous scenery including Olive groves and wild flowers. it’s a short 5 minute drive from the airport and just under 15 minutes from the capital Argostoli. There are a number of decent beaches that are about 30-40 minutes walk away or just a few minutes drive. Trapezaki is a small village set on a hillside. This is a quiet and peaceful resort with only a few tavernas and a couple of mini-markets, if you stay here then you’ll be the sort of person that wants to get away from the crowds and just enjoy the scenery. Trapezaki is probably not a resort for families with kids as the beach here is narrow and pebbly. We want Which Greek Island to be as accurate and informative as possible, so, if you notice anything wrong with the Kefalonia resort guide or any other page please let us know. We’re also on the lookout for great photos to show people what the places we’re describing are like. If you have photos from any of the resorts in Kefalonia or from any of other island on the site then we’d love to see them, simply click the button below to go to the photo upload page. Thanks.